The Deschutes Brewery website was redesigned to provide convenient tools for beer connoisseurs to experience one of the nation’s largest craft breweries. The primary goal was to provide information on their beer offerings, including Year Round, Seasonal, Reserve Series, and Collaboration brews. Secondary goals were to introduce potential visitors to their brewpub locations and brewery as well as tell the story of Deschutes Brewery’s origin and amazing growth. All their craft beers are displayed on the home page in a format that doesn’t require scrolling to view on desktops and tablets. Hovering over a beer reveals a brief description. Clicking on the beer opens up a details area with all the beer’s characteristics. 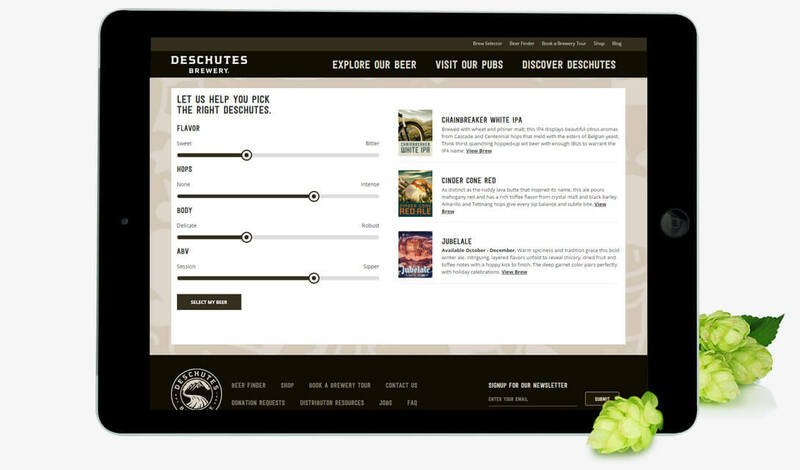 This feature help users select the right Deschutes beer for them by selecting their preferred levels of Flavor, Hops, Body and ABV. Smartz Digital Marketing Agency is proud to partner with the craft beer cornerstone that is Deschutes Brewery. As a rapidly growing craft brewery, Deschutes Brewery requires comprehensive website support to reach customers nationwide. In keeping with their small town roots and their support for the communities they are enjoyed in, Deschutes Brewery relies on social media to get personal with their fans. Deschutes Brewery understands that community and craft beer go hand-in-hand. Smartz is helping them reach communities nationwide.